Vintage Look-A-Likes: Mini Hat Pins & Mother’s Day Give-A-Way! I am so happy to say this was featured on Craft Gossip in the post More Mother’s Day Gift Ideas!!! These faux-vintage cuties inspired by real vintage hat pins are made using corsage pins or T pins and buttons or beads! Pictured are a few I made to inspire you to make your very own set. Vintage is all the rage now but I’ve long wanted my own set of old-fashioned hat pins. I just haven’t yet scoured the antique shops to find them. But with all the blogging and pinning on decorative straight pins my mind turned to making my own “look-a-likes” to grace my pin cushion. You can use vintage (or vintage look) materials or “new-fangled” plastics to create your very own set of lovelies that are as unique as real hat pins. Use beads and buttons and lace from your mother’s or grandmother’s stash to make a memory craft for your sisters, daughters, granddaughters or other family members. Almost everyone has a place this small memory can be pinned – in a pin cushion, in the top of a photo frame, even in a hat (be careful not to get stuck!). 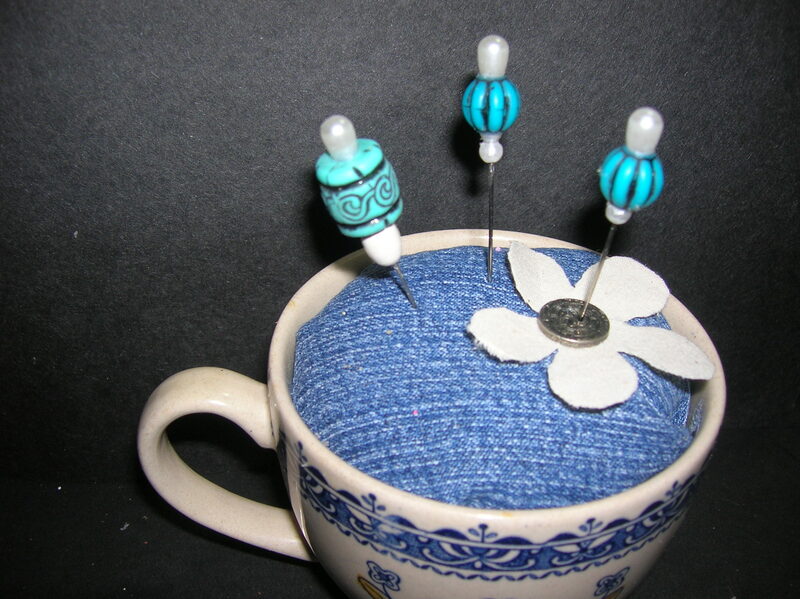 Like my tea-cup pin cushion? 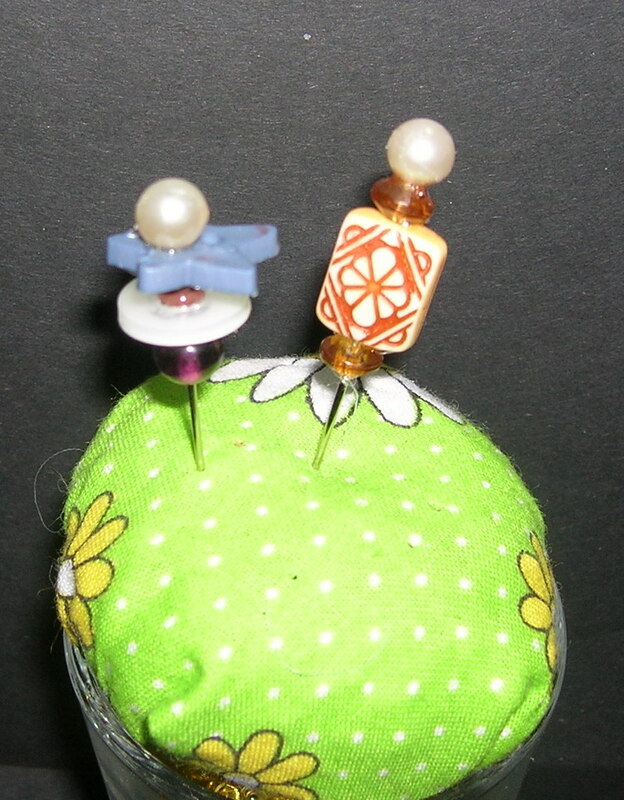 A link for a similar project tutorial, a cookie cutter pincushion, is listed below. Wouldn’t these make a nice Mother’s Day gift? 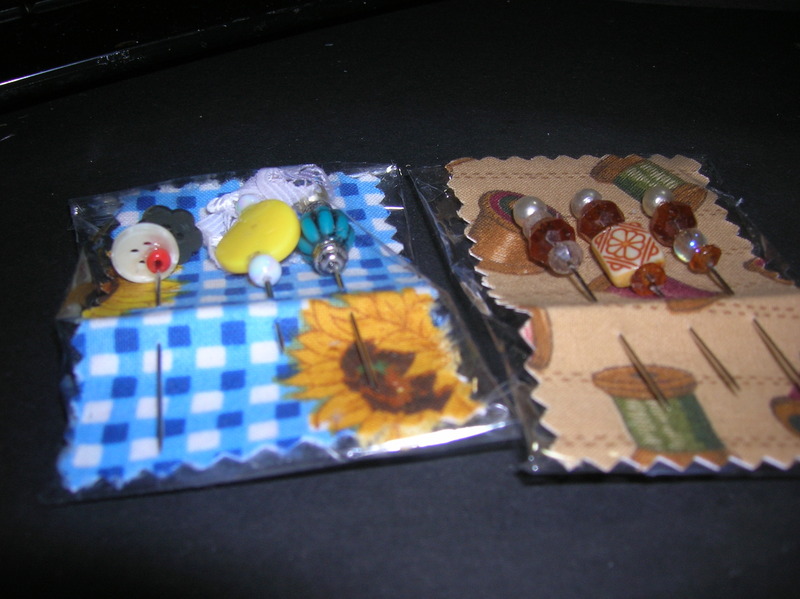 MOTHER’S DAY GIVE-A-WAY: It being Mother’s Day I am giving away a “kit” with materials to make a dozen pins (does NOT include glue): corsage pins, T-pins, lace, beads, and seed beads. Simply follow, rate, pin or share this post then comment below letting me know you have done so. My random number generator (a.k.a. my granddaughter) will choose a number for me and that person will win the “kit”. Give-a-way ends tonight (May 13, 2012) at 12:00 midnight CST. Ok, NO – NOT EVEN ONE – comments on Mother’s Day. SO I will leave the give-a-way open until the Sunday AFTER – May 20th! Still time for u to enter! This is an “on-hand” project aimed at using up those bits & pieces you already have in your craft and sewing stash. I had everything I needed already so the cost of all my mini hat pins was $0! T-pins & corsage pins: $1 and up. Beads & buttons: $1 and up. Novice to Expert and All Crafters In-between! Photo 1: Assemble materials. Dig in your stash for any stray beads and buttons. This is a great project to use “onlies” and beads from broken jewelry, vintage or modern! 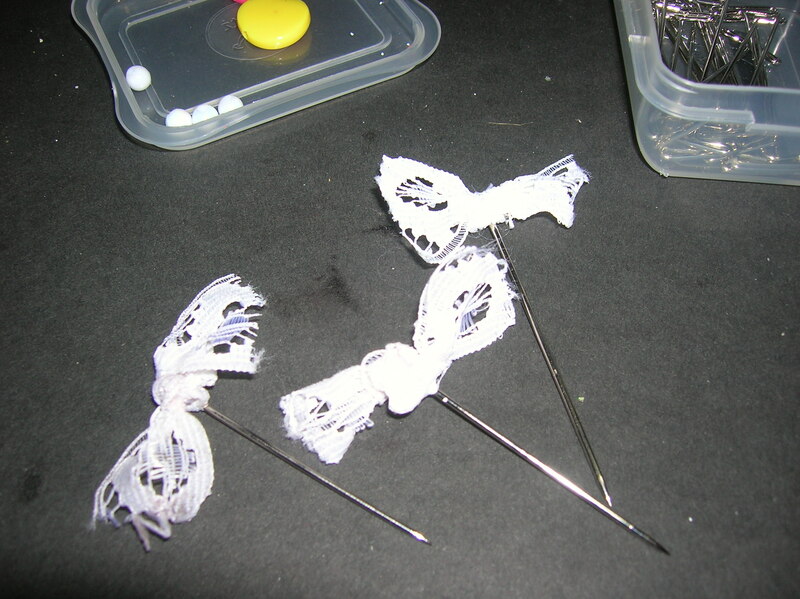 Photo 2: I only had a few corsage pins on-hand so I added a bow to the top of a T-pin to be able to use these. These also worked really great for the buttons I used as it gives you a place to securely glue the button so it doesn’t slide around. Paint the “t” of the T pin to match your lace or the back of the button in order to make it less visible (optional). 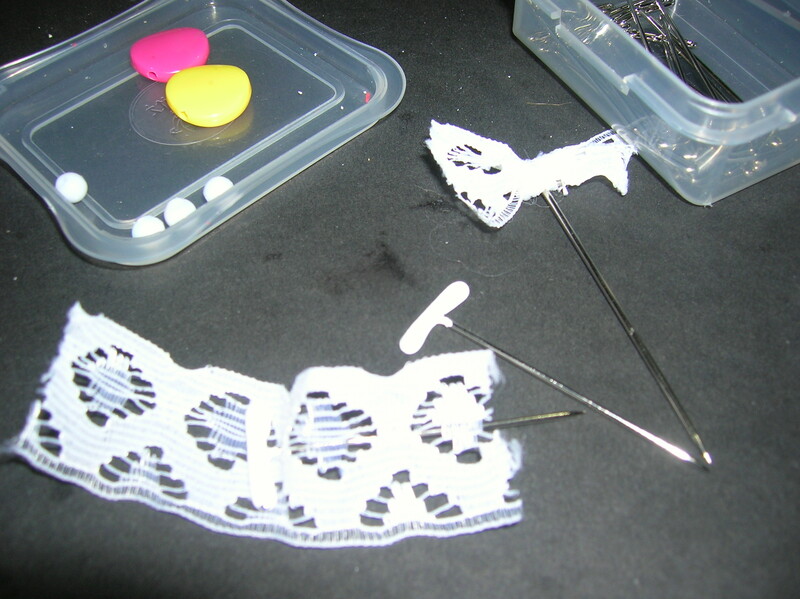 .Insert a T pin into the middle of a 2 inch piece of lace. Skip this step with the corsage pins. Photo 3: Tie a knot in the lace. 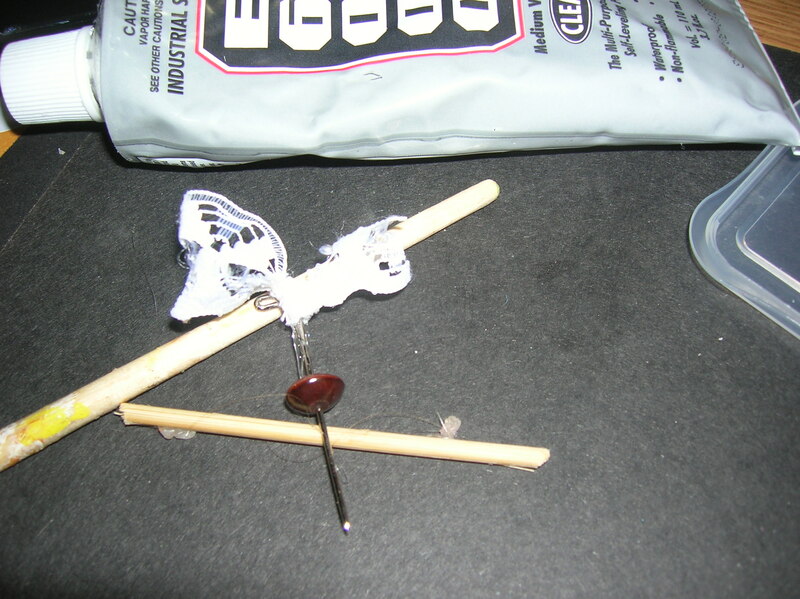 Photo 4: Apply a dab of E6000 glue to the top of the pin with a toothpick and thread on beads or buttons. Push it securely against the top of the pin. Wipe of excess glue and hold it for a few seconds for the glue to set. 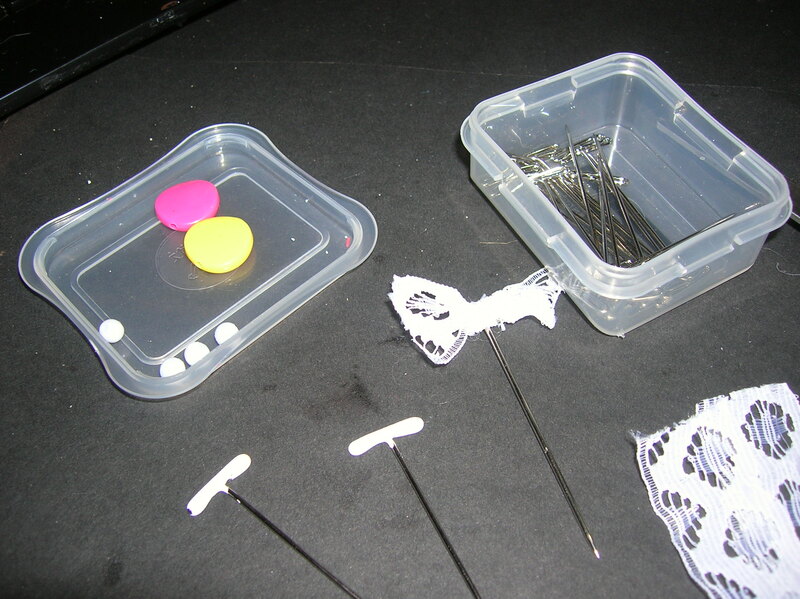 Add a dab of glue before adding each bead. I used three beads on most pins but if you have small beads you may want to try five. Since the E6000 is not going to set hard as a rock immediately you have plenty of time to change your mind about the bead arrangement. 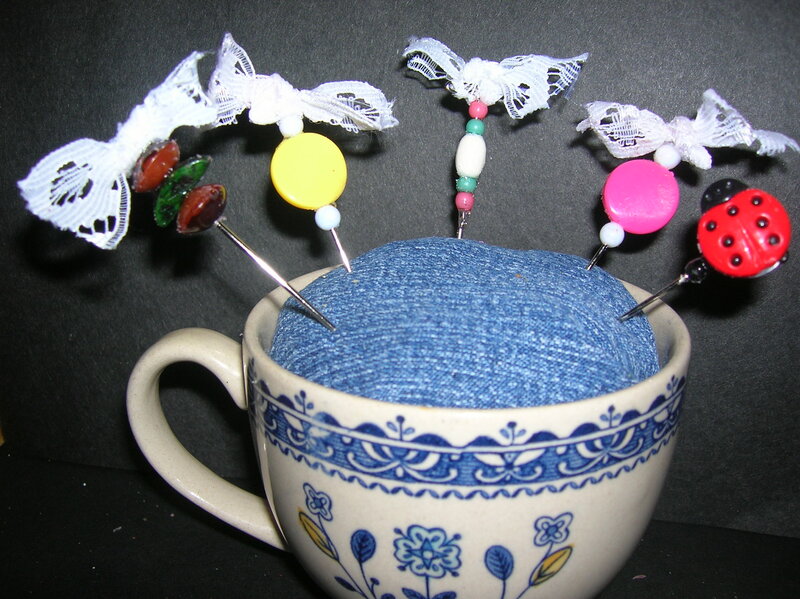 Stick your pins in a pin cushion to allow them time to dry. It will take about 12 hours for the glue to set permanently. And that’s it – your very own imitation hat pins are ready for display and gifting! Photo 5: Once your Faux-Vintage Hat Pins are dry they are ready to package for gifting. 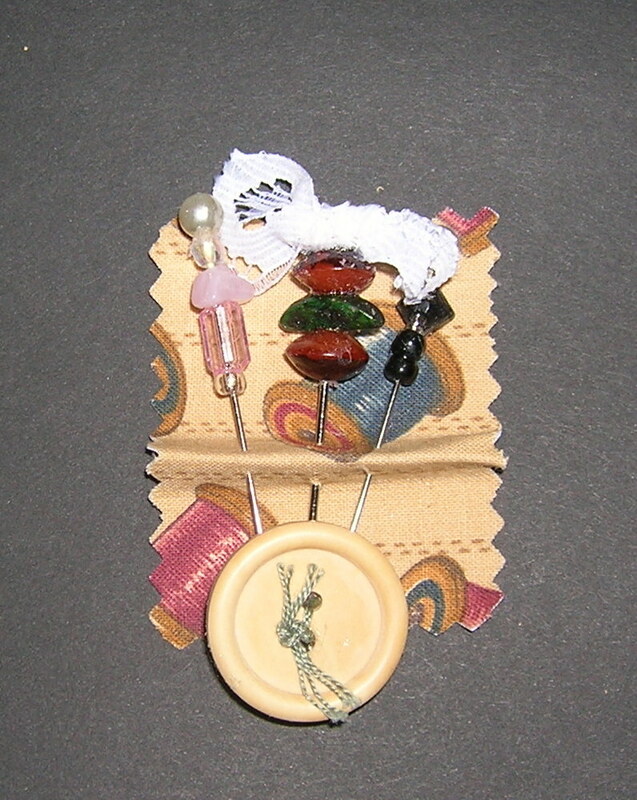 To gift your faux-vintage hat pins glue fabric to an index card. After the glue dries cut a piece of wide enough to hold three or more pins with pinking shears. Make a fold in the card and then insert the pins through it. So no one will get stuck, use E6000 glue to attach a large button to a round mini eraser, let dry overnight then stick it on the end of the pins. Please take a moment to leave a comment and rate this post. Really, please do – I’d love to hear from you.